Introduction to English as a Second language is a course to prepare students studying for Cambridge IGCSE® or equivalent level. Presented in a colourful design and offering clear, practical support for students it follows a variety of interesting themes and topics, with a focus on skills development in listening, speaking, reading and writing. Each of the 18 units provides opportunities for thinking and discussion, along with developing research and study skills. An audio CD is included for use with the listening activities. 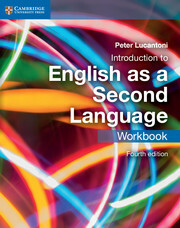 Introduction to English as a Second Language Workbook accompanies the Coursebook (sold separately) in this Fourth edition series, and is presented in an accessible updated design. Each Workbook unit reinforces the topic and theme from the corresponding Coursebook unit, and provides additional practice in reading, writing and listening. Furthermore, each Workbook unit starts with a review of key vocabulary from the corresponding Coursebook unit, and contains a specific language focus. Brand new page design and layout to include more write-in exercises as a record of the students' progression through the course allowing them to build the langauge and grammar needed to study at IGCSE level. Language support ideal for those studying other subjects in English at secondary or high school. International context makes this course suited to students around the world. Part 1. The World around Us: Unit 1. How many planets are there in space? Unit 2. What's a living creature? Unit 3. What's a hurricane? Unit 4. Are there any monsters in the ocean? Unit 5. What's an ecosystem? Unit 6. Can bees scare elephants? Unit 7. Can penguins see underwater? Unit 8. How hot are chilli peppers? Part 2. Human Endeavour: Unit 9. Who was Ibn Battuta? Unit 10. What's the best job for a teenager? Unit 11. Who are the Maasai? Unit 12. What does a triathlete do? Unit 13. How much water do you use? Unit 14. How important is oil? Unit 15. How do you say bridge in your language? Unit 16. Where are the Seven Wonders of the Ancient World? Unit 17. What impact does fashion have on teenagers? Unit 18. What does that sign mean?